Filet Crochet Patterns Part 2. Add 3D flowers to your filet crocheting. 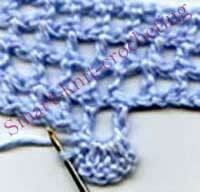 Filet crochet patterns (part 2) are not always traditional flat meshes. 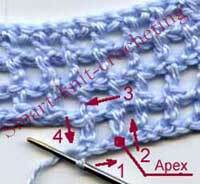 Being a very flexible technique, filet crocheting allows you easily to design your own 3-D filet crochet pattern. 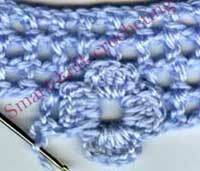 Let's consider one of the ways how to crochet this kind of patterns. 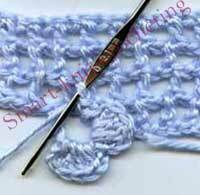 A typical open mesh consists of: double crochet, chain 2, double crochet, (dc, ch2, dc). Each cells of the mesh is a rectangular. To make a 3-D element on the open cell, we are going to use those rectangles as a base. Let's make a 3-D flower with four petals on the cell of mesh. Each side of cell will accommodate one petal of our flower. Each petal is going to have five stitches in it: chain 2, 3 double crochets, chain 2, 1 single crochet to attach a petal to the apex of the mesh cell. To crochet each petal: chain 2, 3 double crochets under existing chain of the mesh, chain 2, 1 sc EXACTLY into the apex of cell (ch2, 3dc, ch2, 1 sc). Ch 2 (first and last stitches of each petal) have to be crocheted INTO the very apexes of the rectangular. This way in every apex there will be two "ch 2" from the two adjacent petals. Arrows 1,2,3,4, show direction of crocheting for each petal. Petal # 1.Turn your work 180 degrees to change direction of crocheting. Follow direction of arrow 1. Petal # 2.Turn your work 90 degrees to change direction of crocheting. Follow direction of arrow 2. Petal # 3.Turn your work 90 degrees to change direction of crocheting. Follow direction of arrow 3. Petal # 4.Turn your work 90 degrees to change direction of crocheting. Follow direction of arrow 4. Last stitch of the petal #4 is crocheted into the same apex where the very first stitch of the petal # 1 was. 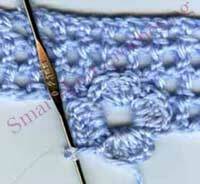 Turn your work the way you crocheted filet mesh before you started to crochet a flower and continue the mesh. Spread flowers over big areas in a regular manner (a single flowers or in a group of a few flowers) creating a new look of the filet crocheted fabric. Decorate a neck line, pockets, or coquette of a sweater or a dress. Create a filet crochet doily pattern using 3-D flowers as decorative elements. Decorate with flowers small forms of crocheting: bags, hats, caps, baby garments, decorative pillows for the sofas and chairs, and etc. 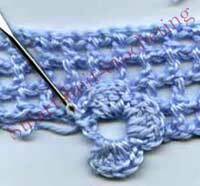 Home › Filet Crochet › Filet Crochet Patterns. Parr 2.